Charity theme is a perfect fit for websites expounding social causes, relief organizations involved in disaster relief, crowdfunding, religious and charitable organizations, nonprofit and NGOs among others. Charity theme offers special Plugins such as Give-Donation Plugin, which will make your task of maintaining the donations received, accounts and tracking of the donations, a piece of cake. In addition, Charity is highly suitable for causes like Tsunami relief, famine and drought management measures, and flood relief projects apart from managing many of these large settlements of expatriates and refugees management camps. The key to managing these special events is a foolproof system to handle the incoming donations from philanthropists and businessmen who contribute to social causes. Keeping track of the incoming collections and maintaining the expenditures incurred for relief measures, food, and medical aid is best handled by Charity theme that comes integrated by the Give-Donation Plugin. The most robust, flexible, and intuitive way to accept donations on Charity WordPress theme. It is much more than just a Donation Form. In Giveâ€™s donor management section you can view and search through a list of donors. Dig deeper and view donorâ€™s profiles which include info about their completed donations, their amounts, and the campaigns they donated to. Though you may choose to integrate Give with your favorite CRM, you have many donor management options right out of the box. The drag and drop page builder makes everyone a designer without the coding know-how! 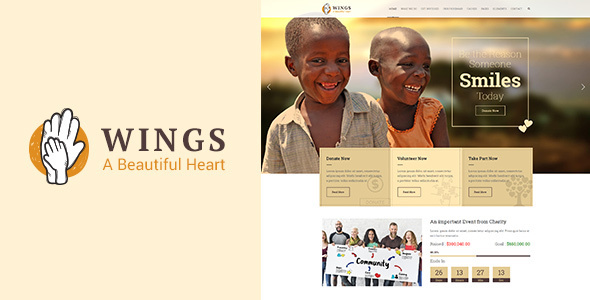 The power of visual composer is integrated into Charity Theme. Create pages quickly with few clicks in few minutes with the help of Visual Composer and custom Charity shortcodes. Includes Visual Composer premium add-on elements like Icon, Info Box, Interactive Banner, Flip Box, Info List & Counter. Best of all â€“ it provides A Font Icon Manager allowing users to upload/delete custom icon fonts. Engrossing content on your site is the key. How to build contents that let your visitor stay on your site for a longer time? In Charity theme, we have incorporated the Slider Revolution Plugin. Creating content using these animated content creation tools, would ensure your site will have an edge over the other sites. We are delighted to integrate eForm worth $38 in Charity theme. eForm is a WordPress form builder using which you can create different kinds of forms for surveys, quizzes, data collection, payment-cost estimation and different types of user feedbacks. It is an amazing tool to run your site successfully as every single interaction with your customers, visitors and others could be captured for data analysis. Intuitive forms such as website surveys, resumes and quizzes could be designed in a simple interface. Therefore, running your site as an admin is going to be an enjoyable job! Kirki is the ultimate toolkit for theme developers using the WordPress Customizer. Charity theme lets you take advantage of its advanced features and flexibility. Simply by abstracting the code, it is easy for everyone to design beautiful and meaningful UI. It helps you to automatically create CSS from your fields. All this in real time while you preview the changes via the customizerâ€™s preview instantly, using the automatic post-Message scripts creation! You will become a professional designer by adding Google Fonts with typography field. In addition, you could add tooltips to help your users. Using the single click demo import, you would be able to download all the demo content and use it as your own after adding your logo and customizing it to suit your organizationâ€™s requirements. This saves so much of your time in customizing the website. The WooCommerce Plugin would enable you to sell online and receive payments in multiple currencies as soon as your site is configured! WooCommerce is a free eCommerce plugin that allows you to sell anything, beautifully. Built to integrate seamlessly with WordPress, WooCommerce is the worldâ€™s favorite eCommerce solution that gives both store owners and developers complete control. The Events Calendar is a carefully crafted, extensible plugin that lets you easily share your events from your site in a beautiful way. Managing events by day, week, month or list is a breeze in Charity theme. Create your events in style and plan your events tickets and advance bookings for the events from your site. Beautiful design, powerful & easy to use features, and impeccable support. Events Calendar PRO comes loaded with a selection of well-designed views. You control which views you share with your users on the frontend Calendar View. The classic calendar never goes out of style. Especially with this fully responsive, tooltip enabled to view. View Detail, List View, Day View, Week View PRO, Map View PRO and Photo View PRO. Designthemes Core Features is a simple WordPress Plugin designed by Designthemes to implement the core features of the themes introduced and developed by them. It is customized to work seamlessly with other Plugins. Slider Revolution is an innovative, responsive WordPress Slider Plugin that displays your content the beautiful way. Whether itâ€™s a Slider, Carousel, Hero Scene or even a whole Front Page, the visual, drag & drop editor will let you tell your own stories in no time! Build Modern & Mobile-Friendly Presentations. Itâ€™s easier than you think. Slider Revolution 5.4 is the latest version in Slider Revolutions with an impressive stream of updates and tons of new features. Charity theme offers a plethora of shortcodes to configure your modules like tabs, accordions, buttons, and tooltips. The shortcodes offered in Charity is mind boggling. Well, almost every conceivable need has been analyzed and these shortcodes have been included. All the requirements of your site for Blockquotes, Buttons & Lists, Carousel, Columns, Contact Info, Content Shortcodes, Custom Posts, Fancy Boxes, Icon Boxes, Image With Caption, Miscellaneous, Number Counter, Pricing Table, Progress Bar, Tabs & Toggles, Team, Testimonials, Carousel Testimonials, Timeline and Typography. Using the extensive documentation, knowledge base and video tutorials you can get any clarification you may require about Charity theme, 24/7.